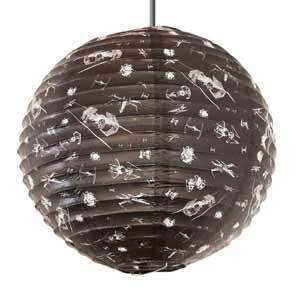 There are a number of Star Wars paper light shades out at the moment and I have to say that on balance I prefer the one that is designed to look like a Death Star. I wasn't overly impressed by this dog fighting X-Wing vs Tie Fighters scene, sure it looks good, but it's hardly something to get exited about. I've never really been a fan of these style of paper lanterns. I think it stems from living in student accommodation in the '90s with them in every room. They're paper thin (obviously) and a fantastic collector of dust. 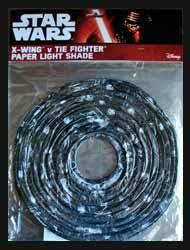 The light shade measures 12 Inch tall x 12 Inch wide and for the Star Wars fan that already has a Death Star paper light shade in their bedroom, this might make a nice addition to your spare room. It's also ideal for those who like to be a little more subtle with their Star Wars appreciation.